The Central Shilha belong to a much larger group known as the Shilha Berbers. 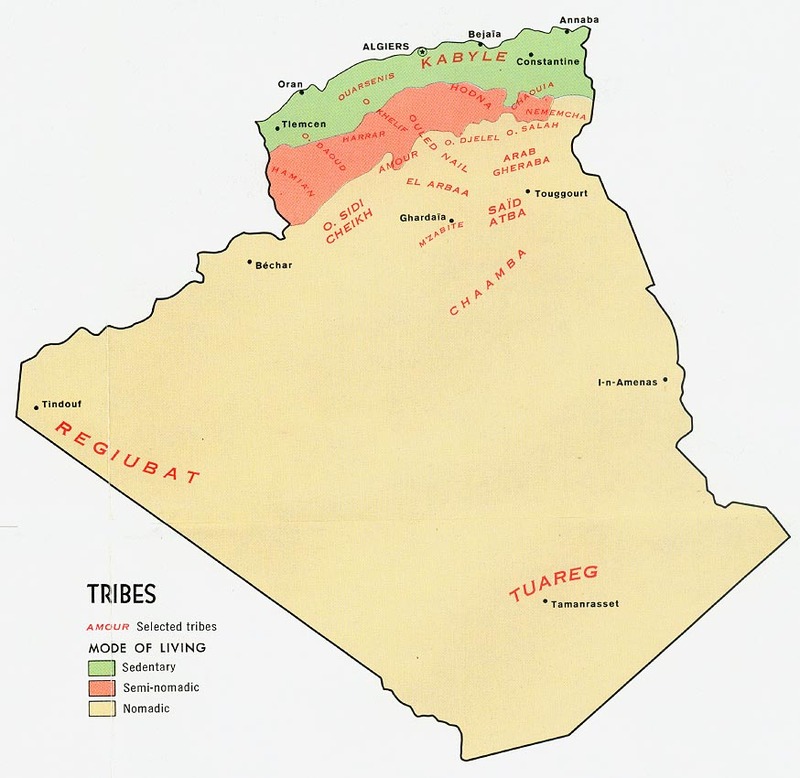 The Shilha are made up of three main groups of Berbers: the Northern (Rif) Berbers, the Southern (Sousi) Berbers, and the Central (Berbaber) Berbers. The Central Shilha live primarily in the beautiful, wooded High Atlas and Middle Atlas Mountains of Central Morocco. However, a large number of them also live on the slopes of the Atlas mountains in eastern Algeria, near Morocco's border. 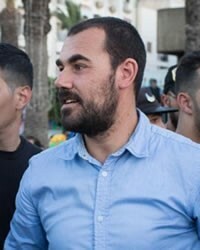 All of the Berabers speak Tamazight; however, many also speak Arabic, Algeria's official language. The Central Shilha are semi-nomadic shepherds. In the mountains, raising animals is economically more important than farming. The dominant feature of Beraber life is transhumance. This means that they transfer their livestock from one grazing ground to another, alternating from the highlands to the lowlands, with the changing of seasons. The Central Shilha primarily raise sheep and goats, although other domestic animals are also kept. Most have a few mules and donkeys, which are used for transport. Only one tribe, the Zain, raises large herds of cattle. The Central Shilha move their herds to the warm plains during the winter months, then to higher pastures during the spring and summer months. Depending on their locations in the mountains, some of the tribes only have to move their herds during the winter. Others only migrate during the summer. A third group moves the herds during the winter and the summer. Although often on the move, none of the tribes are totally nomadic. All of them maintain permanent villages with fortified, community granaries and surrounding farmlands. The villages are never left unattended. A small number of people stay behind to guard the granaries and to plant crops such as barley, maize, wheat, rye, millet, and vegetables. Many Central Shilha villages are found among the highest hills and are often built partially into the mountainsides. Very few villages have electricity or running water, but most have their own internal means of communication. Among the Central Shilha, it is common for three or four generations to live in the same dwelling. All of the family members acknowledge a common male ancestor. As members of the family, they are entitled to certain rights and privileges concerning the family heritage.. The family structure is somewhat of an authoritarian democracy. While the head of the family is responsible for controlling and administering all household matters, he must come to an agreement with the rest of the family. Banishment from the family is considered the ultimate punishment. The Central Shilha are virtually all Muslim; however, their religious practices are based more on traditions and the decisions of the community judges than on the Koran. Their societies are organized around two main systems: Islam and the tribe. However, there are many differences between urban and rural societies. In urban areas, orthodox Islam prevails; whereas, in rural societies, ancient beliefs and customs are intermingled with their Muslim faith. Most of the Central Shilha have continued in their traditional worship of saints. One group of spiritual leaders called marabouts is considered "living saints." They are believed to possess healing abilities and supernatural powers. Each of the villages reveres one or more of these "saints." In the eighth century, invading Arabs forced the Berabers to accept Islam. However, prior to that time, many of them were Christians. 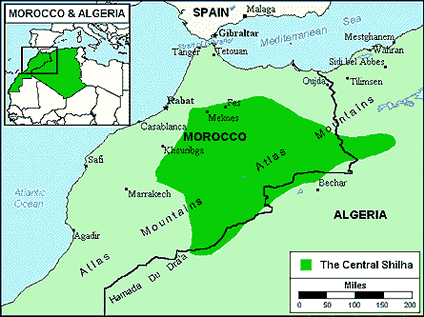 Unfortunately, there are only a few known Central Shilha believers in Algeria today. Additional laborers and tools such as Christian broadcasts are needed to help these precious people return to the God of their forefathers. * Ask God to grant wisdom and favor to missions agencies working among the Central Shilha. * Ask the Lord to raise up additional long-term workers who are sensitive to the Muslim culture. * Pray for God to anoint the Gospel as it goes forth via radio to the Central Shilha. * Ask the Lord to encourage and protect the few known Central Shilha believers in Algeria. * Ask God to call forth prayer teams who will begin breaking up the soil through worship and intercession. * Pray that strong local churches will be raised up among the Central Shilha. * Pray for completion of Bible translation in this people group's primary language.View Berber, Imazighen in all countries.